(by Tamara Mathias, Reuters) – U.S. regulators on Tuesday issued warnings to 13 companies selling e-cigarette liquids for using child-friendly images in their packaging, in the latest crackdown aimed at preventing tobacco sales to minors. The FDA has made several sweeping moves in the past few months, including setting a maximum nicotine level for tobacco products as the regulator attempts to combat tobacco and nicotine addiction. E-cigarettes are handheld electronic devices that vaporize an “e-liquid” fluid typically including nicotine and a flavor component. They have been grabbing market share away from traditional tobacco companies, and are available in different flavors. “It takes a very small amount of these e-liquids, in some cases less than half a teaspoon … to (have) a fatal effect for a kid and even less than that to make them very, very sick,” an agency executive said on a call with reporters. Six of the letters issued were for dual violations where the products were illegally sold to minors online as well as packaged inappropriately. “We don’t have to wait until there’s been an actual injury of a child. We can take action if it’s likely to cause substantial injury,” Acting Federal Trade Commission Chairman Maureen Ohlhausen said. 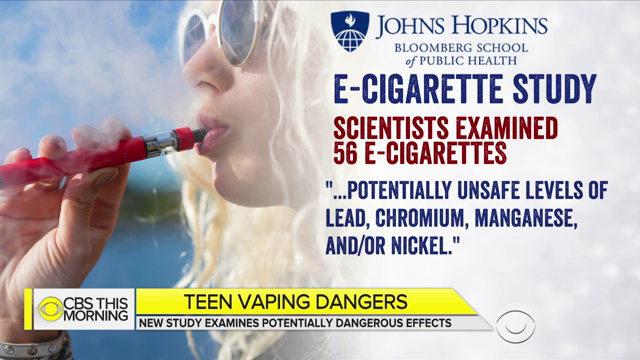 The latest warnings come a week after the FDA sent 40 warning letters to companies on the sale of tobacco products to minors, particularly those made by Juul Labs. Twelve of the vendors issued warning letters on Tuesday did not immediately respond to Reuters’ request for comment. 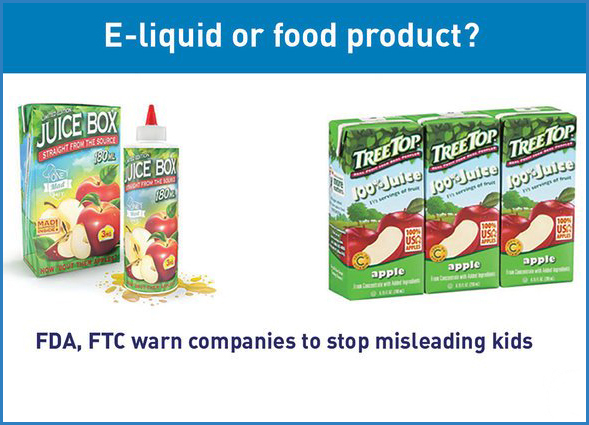 [The agencies told the companies that the products are “misbranded” under the Federal Food, Drug, and Cosmetic Act “because their labeling and/or advertising imitating kid-friendly foods is false or misleading.” In joining the FDA, the FTC cited its authority under the Federal Trade Commission Act, which prohibits unfair or deceptive advertising.]. [The companies have 15 days to respond on how they will change the labels and packaging of the products. Failure to make changes “may result in further action such as seizure or injunction,” the agencies warned.]. Nick Warrender of Lifted Liquids and E-Liquid Retail, which makes Vape Heads Sour Smurf Sauce, said the product had been pulled from the market and repackaged six months ago. 2. How might this harm children? 3. What did FDA commissioner Scott Gottlieb say about the packaging? Be specific. 4. What is the FDA’s goal for the actions it has taken regarding tobacco products in the past few months? 5. a) What are the main ingredients in e-liquid? b) What effect would ingesting e-liquid have on a child? 6. 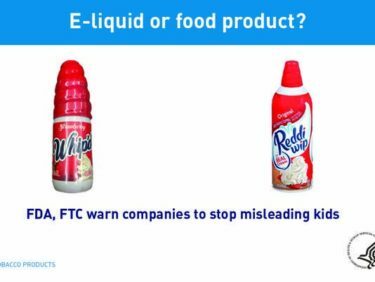 Check out the examples of the e-liquid marketed to look like familiar products that kids eat/drink at FDA.gov. Nicholas Warrender, owner of the company that makes Vape Heads Sour Smurf Sauce complained that his company had spent a lot of money and time to change the packaging – saying that he recognized the problem and changed the design in November to feature a man in a beard, which he said signaled adult use of the product. a) What is your reaction to Mr. Warrender’s claims? b) Do you think these companies innocently/naively package their products to look like candy/whipped cream, etc? Explain your answer. Commissioner Gottlieb, as part of a comprehensive tobacco policy announced last summer, pledged to reduce the level of nicotine in conventional cigarettes to minimally addictive levels and said he believes e-cigarettes could be an important tool in helping adult smokers switch to less harmful nicotine-delivery products. The FDA’s policy also delayed for several years a requirement that e-cigarette makers get agency approval for their products. Health groups have sued the agency over the delay. E-cigarettes could one day be regulated as an over-the-counter drug. FDA Commissioner Scott Gottlieb said Wednesday the agency is considering this option. The agency is re-evaluating and modernizing its approach to the development and regulation of nicotine replacement therapy products to assist smokers in quitting. This includes systems that go beyond nicotine gum, patches and lozenges, which have traditionally been used. “Right now, we’re looking very actively at could we bring e-cigarettes into the over-the-counter regulatory pathway, which would give us many more tools to look at both safety and benefit, and study whether or not an e-cigarette actually does promote smoking cessation and also give us many more tools to actually study the toxicology associated with it and see what effects it might have on the lung,” he said in an interview with Meg Tirrell at CNBC’s “Healthy Returns” conference. The FDA will soon put out guidance documents that address toxicology of e-cigarettes and what additional endpoints it could use to allow products to claim they aid in smoking cessation and smoking reduction, he said. Under Gottlieb, the FDA unveiled a sweeping plan to overhaul tobacco regulation last summer. Since then, the agency has moved to lower the amount of nicotine in cigarettes to minimally or nonaddictive levels. It has requested more information on the role flavors, including menthol, play in attracting people to cigarettes and alternatives like e-cigarettes. It is also reconsidering how it should regulate premium cigars. A group of public health advocates and pediatricians sued the FDA on Tuesday for delaying regulation of e-cigarettes and some tobacco products. Gottlieb said the groups waited until he acted on the parts of his overhaul they liked, then sued for the parts they didn’t. Driving the FDA’s policies is the idea tobacco products exist on the so-called continuum of risk, where conventional cigarettes are the most harmful and other nicotine products are potentially less risky. Adopting the ideology has required the agency to balance persuading adult smokers to quit conventional cigarettes without enticing adolescents and teens. Media reports have chronicled how kids are embracing e-cigarettes, especially the brand JUUL. Gottlieb said the FDA is aware of the problem with JUUL and other products, and the agency will take enforcement action against companies that are unlawfully marketing to kids.